Manatee; photo © Dorothy Cutter / Critterzone Animal - Wildlife - Nature Stock Photography for (all rights reserved; used by permission). Manatees live in coastal waters, rivers, saltwater bays, estuaries and canals (anywhere seagrass beds can be found). This gentle giant is one of the most endangered marine mammals in the United States. Manatees are completely herbivorous (plant eating), consuming up to 15% of their body weight daily in vegetable matter. Manatees (also called sea cows) breath through their noses at the surface every 15 minutes or so when resting. When active they must breathe every few minutes. Their lungs are very large and also used for buoyancy control. Boats are the biggest threat to the manatee - more than half of manatee fatalities are attributed to collisions with boats and barges, and fatal injuries from propeller blades are also serious problem. Mature manatees can grow to 8-14 feet in length and weigh more than a ton. A female manatee matures somewhere between 5-9 years, males mature later at 6-9 years. The female bears just one calf every 2-5 years after a gestation period of 13 months. 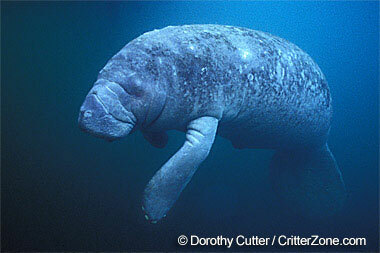 The newborn calf weighs about 40 lbs and will remain with the mother manatee for several years.